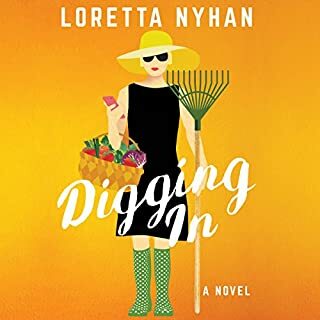 A 1937 vintage camper trailer half hidden in weeds catches Lynne McBriar's eye when she is visiting an elderly friend, Ben. Ben eagerly sells it to her and she just as eagerly embarks on a restoration. But after each remodel, sleeping in the trailer lands Lynne and her daughter Dinah in a previous decade - exciting, yet frightening. Glimpses of their home town and ancestors 50 or 60 years earlier is exciting and also offers some clues to the mystery of Ben's lost love. Who'd have preferred a trailer over a Police Box? How many of us have wished at some time or other we could go back in time and change an action or a decision or just take back something that was said? But it is what it is. There is no rewind, reboot, delete key or any other trick to change the past, right? Lynne McBriar can. She bought a 1937 camper that turned out to be a time portal. And when she meets a young woman who suffers from serious depression over the loss of a close friend 10 years earlier, she has the power to do something about it. And there is no reason not to use that power. Right? I think That I made it pretty clear in my review of the first book, that I am a complete and total sucker for a good time travel story. Book one was a fun romp over different time periods and played out well. Book 2 The Trailer on the Fly does see some time travel, but only to one very specific destination. This time, Lynne McBriar goes back in time to help someone out. To make their life better, and in the process learns that changing things for one person may affect your own life in unforseen ways. I liked this aspect. It was like the Butterfly effect without the murders and explosions. It was more about bonding and friendship, and while I went in for the time travel I came out with a lot more than I expected. Nortman writes some exceptionally emotional prose that can really pack a punch when she wants it to do so. 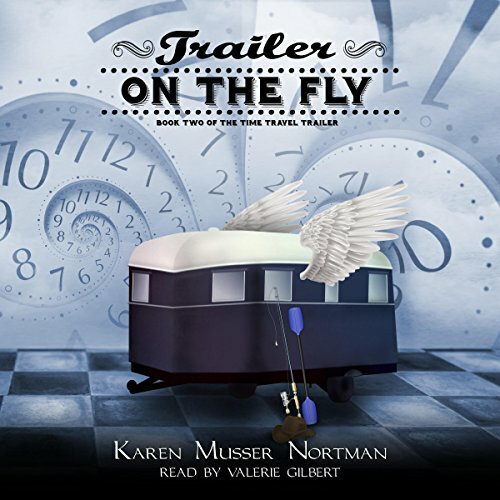 Gilbert flies the trailer as the narrator, and she is just perfect in her roles. She really plays out the emotional scenes, and the quiet scenes as if she were an oscar caliber actress. You need that in a narrator. She does a fantastic job and if there is a third book, I do hope she will return for more. Even though I did receive a promo code for this review it in no way influenced my considerations of the material, and in fact, inspired me to be more honest. In fact, getting a code generally makes me harsher as a reviewer as I am more often concerned what someone like Me will decide based on my review. Excellent quickie good for an afternoon of reading. Well written without being syrupy. Real problems with interesting solutions, and I always did love a good time travel book! Valerie Gilbert shines in this performance. This was good, just not as good as the others. There was good narration by Valerie Gilbert. I enjoyed this book just as I did the first. Lynne makes a deliberate trip to the past in hopes that she can change a young woman's life. In the process she changes her life and it seems not for the better. Her adventures while there are quite exciting and the Sisters on the Fly are hilarious at times. 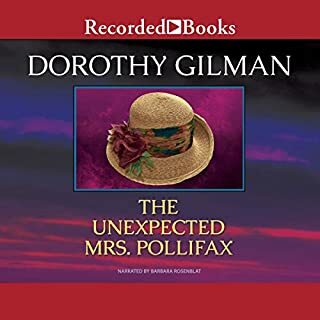 Another well done narration by one of my faves, Ms. Gilbert is so in tune with the characters, gets you involved in the story. "A mystery meets time travel? Gimme that!" was basically what I thought when I discovered this book. I also discovered that more than a mystery, it is a book about relationships - with friends, husbands and daughters. It passes Bechdel test easily :) (that's the one you pass when in your work of fiction you have two women talking about something else than a man). There's a depressed customer, a group of quirky women having a weekend off and, of course, danger and strife! The story flows well and the narrator, Valerie Gilbert, does a great job. It's just lovely. You'll enjoy it. What if, indeed, Mrs. Norton, what if, indeed…. It just makes sense! Sure, she could have gone with a flashy DeLorean, she could have chosen an implausibly spacious phone booth, or she could have gone all out with a modern naval warship, but all of those have been done before. Nobody, so far as I am aware, ever has time-hopped in the comfort and homespun style afforded by a well-stocked, American-built camper. Brilliant! Perhaps unsurprisingly, this series isn’t the first of Norton’s to feature trailers. “The Long, Wrong Trailer” is about a couple who spend their retirement traveling around in an RV and encountering mysteries. And then there’s the “Camping Can Be Murder” series, also about retirees camping and, well, solving mysteries. This information only serves to reinforce my belief that Mrs. Nortman might just be America’s foremost expert on solving mysteries while camping. Finally, one very positive aspect of Norton’s writing that is worth mentioning is the solidarity she creates between her female characters. Atypically, one might assume, these women are more concerned with enduring friendship than with fleeting romance. No shirtless hunks parade about, taking center stage, leaving distress and broken hearts in their wake. Male characters, when they are present, are ancillary at best and suspect at worst. This is not to cast the book as dismissive to its male characters; they do have their parts to play, and the story itself is not gender-exclusive although female readers probably will prefer it more so than men. What impressed me is the novel's unapologetic celebration of the lifetime bonds that women form with one another. These women have much more to talk about than men, which, it might be added, easily catapults it past female stereotypes, measured by standard devices such as the Bechdel Test. As for the plot and story elements, the novel is interesting enough and dangles its outcome elusively. 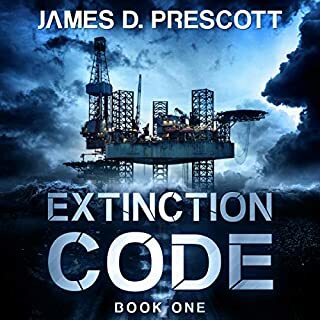 The mystery presented in the opening chapters is appropriately strange and intriguing, and the narrator very pleasantly delivers the story and does a fine job overall. Perhaps one easy way to describe the content is by contrasting it with the likes of, say, popular author Karen Slaughter, legendary for producing dreadful, fear-inducing torture tales—the polar opposite of what you will find in this family-friendly mystery series. Where Slaughter is all blood and razorblades; Norton is more about family and friends, cookouts and close-calls…and most importantly, camping. Quick enjoyable short story. While this is an entertaining and enjoyable addition to the series I did not like it as much as the first story. I love time travel stories and I guess I just expect a little more time in my travel. These stories are fun, light, clean easy afternoon listens. In this story Lynn uses her unique travel trailer to help a young depressed woman. Time-traveling has a ripple effect and things may not always turn out the way you think. 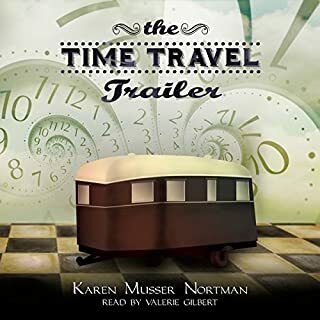 Valerie Gilbert does a good job with the narration. Pleasant voice easy on the ears. Clearly spoken with a smooth even pace. What a great and unique idea for a series of books. I love the concept of a time traveling trailer. The character development was great, to the point where the strained marriage was uncomfortably annoying. (perhaps it hit too close to home) An A+ for creativity and very entertaining. This was a fun time travel mystery. I haven't read the first book but the story stood on its own, which was nice. Interesting story and fun characters I really enjoyed. I think I'll go back and grab that first book now. The narrator did a really good job. Great performance. This was a fun sassy and interesting book. 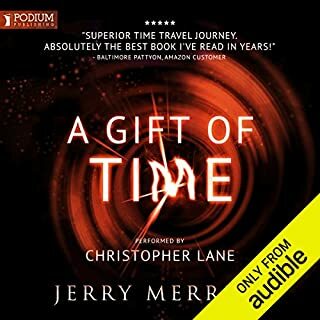 If you can over look the quirks in time travel in general you will enjoy this book. 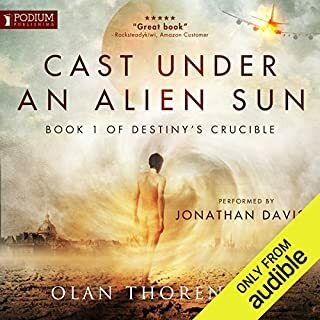 It is beautifully narrated, and I enjoyed it very much. I was provided this book at no cost to me in exchange for an honest review.